Admission: Florida, 2002; Ohio, 2003, S.D. Ohio 2003, N.D. Ohio, 2004, U.S. Sixth Circuit Court of Appeals, 2005. 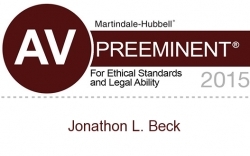 In 2015 Martindale-Hubbell® awarded Jon its highest rating: AV Preeminent®. AV Preeminent® is a significant rating accomplishment – a testament to the fact that a lawyer’s peers rank him or her at the highest level of professional excellence. Ohio SuperLawyer magazine named Jon a “SuperLawyer” in 2014 and 2015 in the field of civil litigation, a designation awarded to less than 2.5% of all lawyers in Ohio. SuperLawyers is a joint publication of Law & Politics and Cincinnati magazines. .
Jon is a member of the Ohio and Florida State Bar Associations, the National Association of Subrogation Professionals (NASP) and the Ohio Association of Civil Trial Attorneys (OACTA). 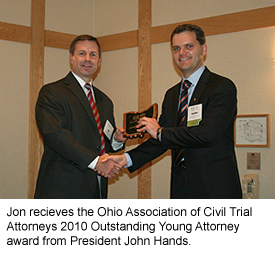 On November 11, 2010, OACTA awarded Jon its 2010 Outstanding Young Lawyer Award. On July 8, 2009, Jon was recognized by a national legal publication for a notable trial victory in Cincinnati, Ohio (“And the Defense Wins!”, DRI -The Voice, Jul. 8, 2009). Jon defended Xerox Corporation and its employee against claims of negligence. The other side sought $1,600,000 in damages. After a 2 ½ week trial the jury returned a defense verdict in favor of Jon’s clients. Jon represents less fortunate clients free of charge through the Dayton Volunteer Lawyers Program. He is a member of the Clara Barton Society of the Dayton Chapter of the American Red Cross. He is involved in the community, graduating in 2009 from the City of Dayton Neighborhood Leadership Institute. In 2014 he became a Fellow of the Ohio State Bar Foundation. 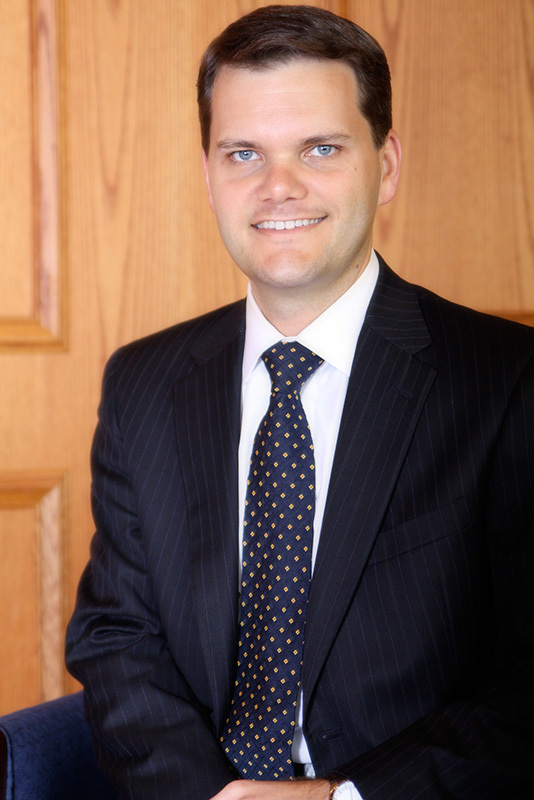 Jon is the Chairman of the Attorney Grievances and Discipline Committee of the Dayton Bar Association.